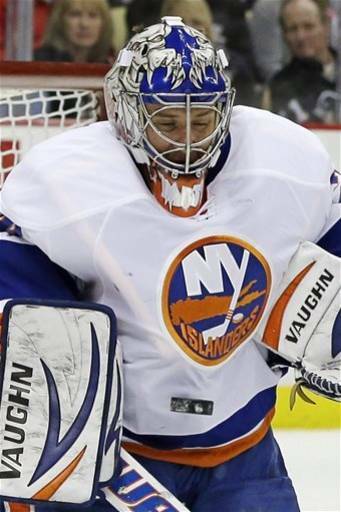 The New York Islanders have long been looking for a goaltender to establish himself as the #1 option. Kevin Poulin will make his third straight start for the Islanders tonight vs. the Los Angeles Kings. This will only be the third time in Poulin's career that he will start in three straight NHL games. It happened in both the 2010-11 and 2011-12 seasons, but both of those times, Poulin was the #1 goalie by default because the Islanders had numerous goaltender injuries. This is the first time Poulin has played well enough to earn three straight starts, relegating Evgeni Nabokov to the bench. Looking at the numbers, it's simple to see why he will start. He is playing well. In six games this year, he is 2-4-0. One of those four losses was a 1-0 decision at Carolina last week. You can't expect him to be perfect. In his last four starts, Poulin has a 1.75 GAA and a .939 save percentage, both outstanding numbers. For comparison, in Nabokov's last four starts, he has allowed 17 goals and hasn't had a save percentage above .875 in any of those games. The coaching staff had no choice but to start Poulin and keep playing him as he played well. How long can the Poulin wall keep backstopping the Islanders? When I was just seven years old, I attended my first Islanders game. That day was one to remember. I remember an usher gave me a souvenir puck as we were leaving the game. I remember thinking that the team in the green jerseys, the Dallas Stars, were the good team. I don't remember the video below too well, but I remember the Islanders winning. Take a look. After that, I was hooked. Later that winter, I wrote a letter to the Islanders with a bunch of questions. Surprisingly, I got a response a few weeks later, as you can see below. The signature on the bottom of the letter belongs to Mike Milbury, who was the Islanders general manager at the time of the letter, which was late in 2001. Getting a letter on official Islanders stationary from their GM was something I always treasured. I've kept that letter for almost 12 years, and although the stuff Milbury writes about might be random answers to questions I have, the letter has a much greater meaning to me. I am a New York Islanders fan. From all the bad to all the good that hopefully will come soon, I'll be rooting for the blue and orange. This letter helped start it all. Sorry for the long delay between entries. This has been a busy time. 1. John Tavares is named Captain. 2. 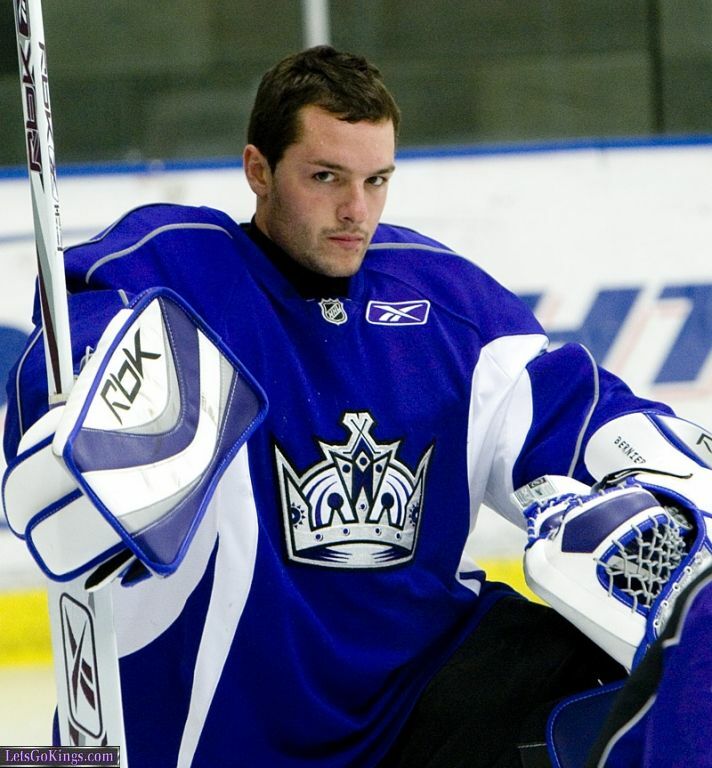 Jonathan Bernier becomes an Islander in a trade that gives up Nino Niederreiter. 3. So does Rob Scuderi, via free agency. 4. Brock Nelson and Matt Donovan make the team. That's all for right now. I'll be back in August with more news and opinions! Enough hoping for the future. Enough waiting for prospects. Enough complaining about the past. As I write this entry, the New York Islanders sit in ninth place in the Eastern Conference, tied with the rival Rangers in points, although the Rangers have one more game left than the Islanders. 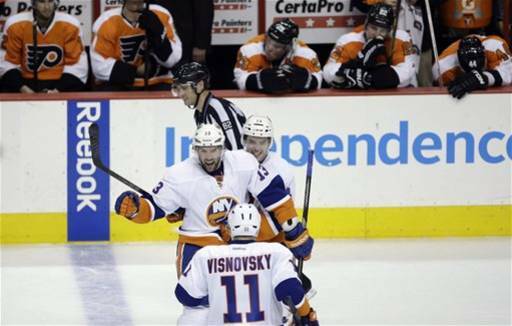 The Islanders are right on the cusp of their first playoff birth since 2007. Is this what we have been waiting six years for? Throughout all of the third period collapses, the Islanders have been resilient. They have gotten contributions from everyone, and they will need to keep that up if they want to play in May. Here are three keys to the Islanders success that they will need to get if they want to play in the playoffs. Every playoff team has a great goaltender. The Islanders have one in Evgeni Nabokov. He is tied for fourth in the NHL with 16 wins. He has been in net for every single one of the Islanders wins. Out of all of the Islanders, Nabokov is the one who knows exactly what it takes to make, and win, the playoffs. He has played in 80 playoff games with the San Jose Sharks over a decade, winning half of them and recording seven shutouts. Nabokov should start every game for the Islanders down the stretch of the season, unless they are playing games on consecutive days, which only happens twice for the rest of the year. Kevin Poulin should start at least once, but no more than twice if the Isles stick around in the race. The Lubomir Visnovsky saga is over, he is an Islander, and he is a very good hockey player. 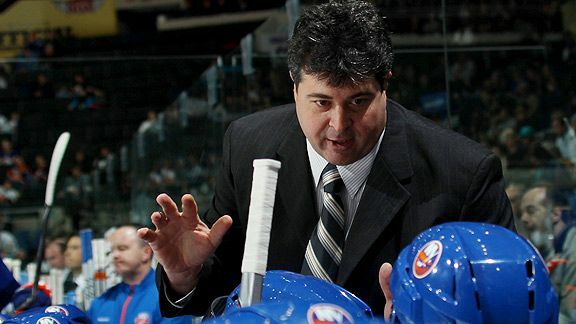 He, along with Mark Streit, have been in command of the Islanders powerplay from the time Visnovsky arrived on Long Island. If the Islanders are going to win, they are going to need to get the contributions from the point, especially by Visnovsky and Streit. Travis Hamonic and Andrew MacDonald have been solid as the Isles top defensive defensemen the entire year, and they will continue to go up against the other team's top lines. If the Islanders are to win, the D is going to have to be up in the rush creating offense, as well as shutting down opponents. The Islanders are an NHL worst 6-11-2 at Nassau Coliseum. Outside of the Coliseum, the Isles are 10-5-1. Luckily, they only play five more games at the Coliseum the rest of the way, while eight games are played on the road, including a five game road trip to end the season. I really can't explain why the Islanders have been so bad at home, but the schedule is in their benefit going down the stretch. The Islanders have been great on the road, and if they keep that up, they not only will make the playoffs, but may have a chance to shock the NHL. I fully believe this is the year the Islanders take the step into the playoffs. Will they make it? We'll find out in a month. 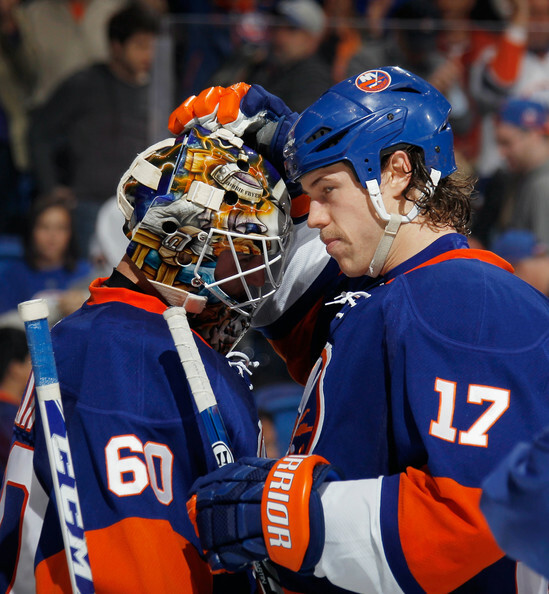 New York Islanders: Circus or Contender? Going into last Sunday afternoon's home game against the Devils, the Islanders were 4-2-1, and atop the Atlantic Division. They were the owners of the league's top ranked penalty kill, as well as the number one ranked power-play. Now, the Islanders are 4-6-1, and in the Atlantic Division basement. The power-play has slipped to 14th in the NHL. The penalty kill has also slightly dipped, it is now 5th in the league. We have all seen this happen before, the Islanders get off to a hot start then fade quickly in the middle of the season. Is it happening again? Maybe. Is there reason to believe that this year may be different? The past week has been a nightmare. 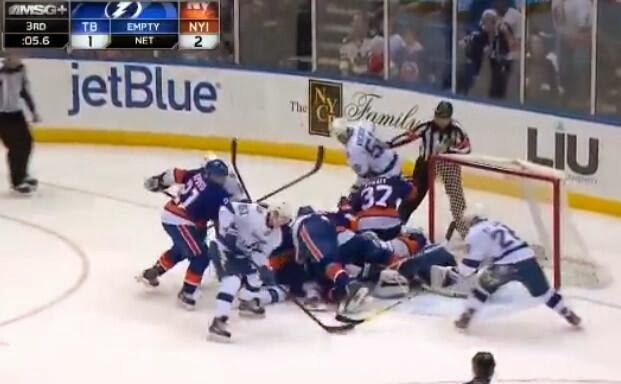 The Islanders constantly coming out sloppy, only to fight back and come just a little bit short. Either that or they would just not show up at all. During the Super Bowl Sunday matinee against the Devils, the Islanders played well for the first 56 minutes, then the Devils broke through for a power-play goal, and added two more for a 3-0 final. Then, they played Pittsburgh two days later. Again, the visitors opened the scoring with a power-play goal. And again, the Isles could not come back. After falling down 3-0 in the third period, the Islanders ended their goalless drought at just over 103 minutes. The next goalless drought was only 35 seconds. The two quick tallies were enough to give Islander fans hope. 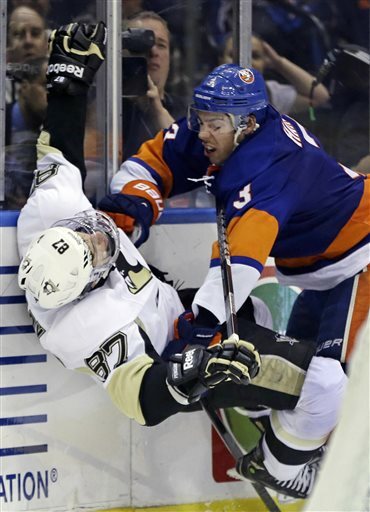 But, as it is with the Islanders, the defeat had to be slow and painful. They never quite got over the hump, and fell to Pittsburgh 4-2. This defeat came one week after they dominated the Penguins from start to finish for a 4-1 win in Pittsburgh. Then something unexpected happened, this time off the ice. Garth Snow, never one to shock the hockey world, made a trade. 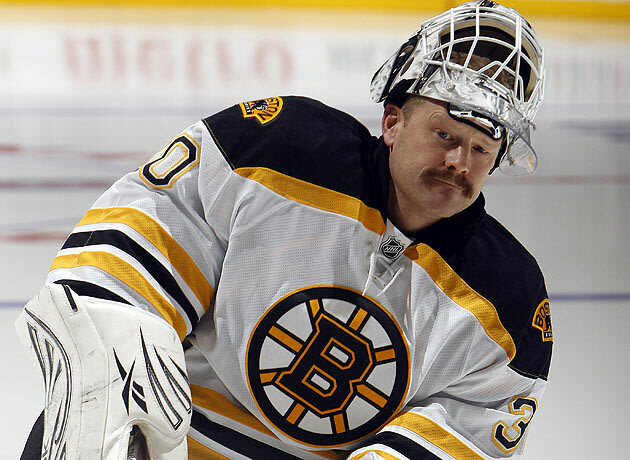 Tim Thomas, former Vezina Trophy winner in Boston, would be a New York Islander, at least in theory. Thomas is taking this year off from the NHL. He is 38 years old, and not getting any younger. He hasn't played a game this season, and that isn't likely to change. The Islanders would send Boston a 2nd round draft pick, in either 2014 or 2015. That pick will only go to Boston if Thomas plays this season. So, the Islanders practically got Thomas for free. You are probably wondering why would the Islanders do this. Thomas' salary for this season is $5 million. He isn't getting paid by Boston because he is suspended, and he isn't getting paid by the Islanders either. However, his salary will count towards the Islanders this year, and they need the $5 million to reach the cap floor, or minimum salary. The Islanders pretty much traded for a phantom $5 million. The Islanders could do what they did to Evgeni Nabokov a few years ago, and toll his contract so he would have to honor it next year. That option is unlikely, but not impossible knowing the Islanders. Thomas is a free agent at the end of this season, and I'm guessing the Islanders would love to have him on the roster next season as a short term solution, and if Thomas doesn't want to be an Islander, then Garth Snow would have made a good financial move to help his team in the lockout shortened season. Hours after that trade was announced, the Islanders took the ice at Madison Square Garden to play the rival Rangers, who were also struggling, for the first time this season. They once again came out flatfooted. The Rangers scored on Evgeni Nabokov on the first shot he faced all night. After one period, the Isles were down 2-0, and they looked out of it after that. 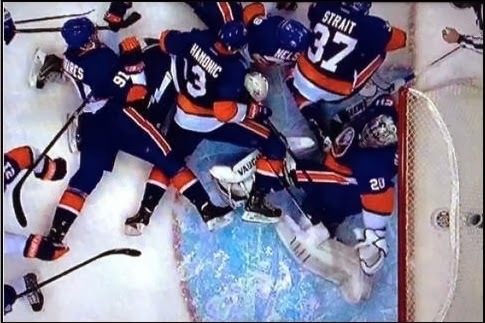 The one bright spot throughout this whole ordeal, John Tavares, got the Islanders to within one, but they never got any closer than that. The penalty kill allowed another goal, and the Islanders left MSG without a point. They head right back there this Thursday. The past game this Saturday was the tip of the iceberg of Islanders frustration. They finally got two players into the lineup for the first time this season. Josh Bailey made his long awaited return from an injury he got playing overseas during the lockout. Lubomir Visnovsky made his long awaited Islanders debut after the whole fiasco he had with the KHL and his family issues in Slovakia. Both played well. Bailey registered seven shots on goal, while Visnovsky looked good with Mark Streit on the power-play and had no trouble getting the puck on net himself. The Islanders fell behind twice, but rebounded each time, as John Tavares scored in the first and Colin McDonald tallied his first as an Islander in the 2nd. After two periods, the Islanders had outshot the Sabres 29-11. The Sabres once again took the lead, but there wound be no charm for the Islanders on the third time they fell behind. Buffalo goalie Ryan Miller stood on his head, made 41 saves, not including the two that the post made on John Tavares in the 3rd period, and the Islanders lost 3-2. Tomorrow, the Islanders host the Carolina Hurricanes. For the first time, I am hoping that Rick DiPietro starts in net. Evgeni Nabokov looks tired in net, and Ricky at least deserves a chance. Now you decide, are the Islanders a circus or a contender? I'd love to hear your opinions in the comments.